Mark Leahy, central utility plant chief engineer, in the boiler room outside Clark’s cogeneration plant. Hidden beneath Clark University’s lawns, gardens, and walkways, a network of pipes and electrical cables snakes its way to the main campus buildings, ensuring hot showers and cooled air, steam, and electricity, day and night. How that energy is created is a point of pride in the university’s legacy of sustainable practices. Much of Clark is powered by the cogeneration plant, which is housed in Jonas Clark Hall and managed by Mark Leahy, central utility plant chief engineer, and his team. Leahy, who has been with Clark since 1996, “is widely recognized as a leader in the cogeneration industry,” says Dan Roderick, director of facilities management. He adds that Leahy successfully managed the installation of a replacement cogeneration engine in 2013 to supply more electricity, steam, and hot water through existing distribution lines. At a recent workshop sponsored by Eversource, “How Colleges and Universities Cut Energy Costs with Combined Heat and Power,” Leahy shared his extensive knowledge of cogeneration technology. The event was attended by facilities leaders from area universities and businesses, as well as representatives from National Grid. Leahy explained that an increasing number of institutions in the Worcester area, including hospitals and other colleges, are interested in converting to the cogeneration model, also known as combined heat and power, or CHP. And for good reason. He estimates that since its installation, Clark’s cogeneration plant has saved the university approximately $15 million — from $300,000 to $600,000 annually. Anyone who wants a peek at the new cogeneration engine can view it through the large windows on the corner of Jonas Clark Hall, facing Goddard Library. Leahy also conducts tours of the plant, both for faculty who want to introduce their students to this form of energy generation, as well as area plant managers who are considering converting their facilities to the CHP model. But you don’t don’t have to be part of a physics or engineering class to learn about cogeneration. Jenny Isler, Clark’s director of sustainability, leads an annual tour of the plant for staff and students. The cogeneration plant was one of the factors that led to the university’s inclusion in The Princeton Review’s “Guide to 399 Green Colleges” in 2018. 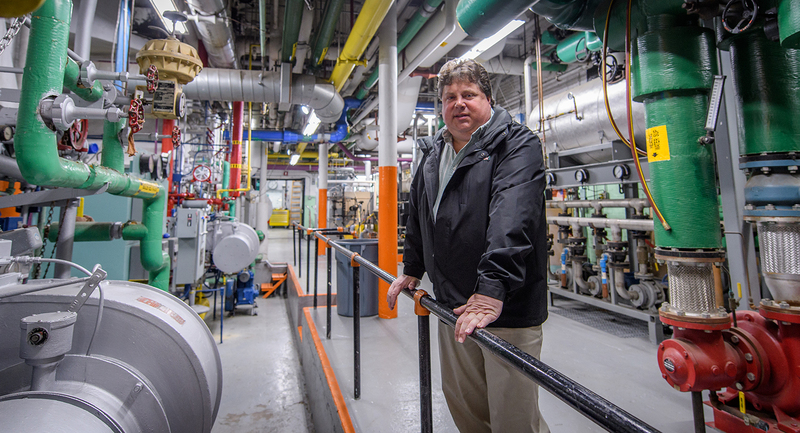 From Clark Magazine: Read about Leo Breton ’85, who, while a Clark senior, was tapped by the Physics Department to determine why the new cogeneration plant was not operating at capacity.